Comments: Charles Wellington Jones (1865-1924) wed Cora A. Sheppard (1873-1974) at the Scottsville Baptist Church on October 7, 1899. Charles was a native of Harrisonburg, VA, who had moved to Charlotte, NC, in 1895 as a bachelor and established a grocery store under the name of "Moore & Jones." Subsequently, he became an accountant of the Charlotte Consolidated Construction Company, the developers of the Dilworth neighborhood in Charlotte, NC. Cora was born in Virginia and graduated from the Female Institute (now called Stuart Hall), a boarding and day school in Staunton, VA. She became a teacher, affectionately remembered by her students as "Miss Cora", and moved to Scottsville where she taught at Scottsville School. 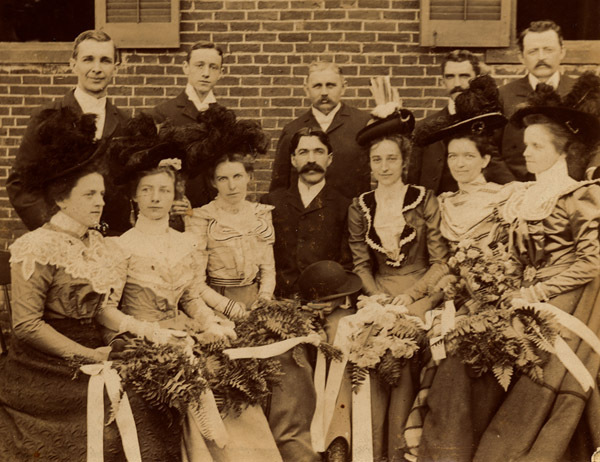 How Cora and Charles met is unknown, but Cora staged her wedding at the Scottsville Baptist Church, which was attended by young Scottsville men and women of roughly the same age as the bride and groom. (1) Theodora 'Dimple' Blair (b. ca. 1874, Scottsville, VA), sister of Joseph P. Blair (standing at far right in this photo) of Scottsville. (2) Pearl Jeffries(b. ca. 1874, Scottsville, VA): Pearl was the daughter of Scottsville druggist, Virginius B. Jefferies, and Anna (Lewis) Jefferies. (3) Lucy Powers: Lucy was the youngest daughter of Dr. and Mrs. D.P. Powers of Scottsville and an employee of the National Bank in Scottsville in 1899. After 1900, Lucy taught elocution classes at Scottsville's 'School on the Hill; by 1930, Lucy was a teacher in a parochial school in Richmond. (4) Charles Wellington Jones, Groom: After their wedding, Charles and Cora moved to Charlotte, NC, where they purchased a house in the Dilworth neighborhood. In his later years, Charles established the Industrial Bank of Mecklenburg. Charles passed away at his home on October 19, 1924. (5) Cora A. Sheppard, Bride: Cora and Charles had three children, Charles Wellington Jones, Jr., who was killed as a teenager in a train accident, Margaret Jones Ormand, and James Nelson Jones. Cora was a teacher for 37 years, continuing her career at the D.H. Hill School in Charlotte and later at the old Alexander Graham Jr. High Shool. She and her husband were members of Pritchard Memorial Baptist Church in Charlotte where she served as organist for many years. Cora passed away at the age of one hundred on April 30, 1974, in Charlotte. (1) Walter Dorrier: Walter was cashier at the National Bank of Scottsville at the time of this photo. He owned a farm just 3/4 mile north of Scottsville on Rt. 20. (2) Emory Hill: Emory was the youngest son of Major James C. Hall and Mary Emory Lamb. Emory completed his MD degree at the Medical College of Virginia in 1907 and by 1919 was recognized as one of the outstanding ophthalmological specialists in the South. (3) Rev. J.R. Daniel: Reverend Daniel served as pastor of the Scottsville Baptist Church from 1887-1906 and officiated at this wedding of Charles and Cora (Sheppard) Jones. (5) Joseph P. Blair: Joseph was a prominent dentist in Scottsville with offices near Mink Creek on Main Street. Dr. Blair served for many years on the Scottsville Town Council, and on the Scottsville District and Albemarle County school boards for 37 years. At his death in October 1, 1931, Dr. Blair was the only chairman the Albemarle County School Board had ever had.